1. Clean Prawns. Keep them whole . 3. 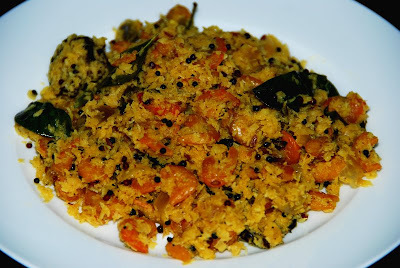 Grind together grated coconut, turmeric powder, a few half portion of the sliced onions, ginger/garlic paste,Cumin Seeds,green chillies and mix with coconut.Dont let the ingredients to grind too much. 4. Soak kumkum in warm water. 5. Heat a pot, add some oil,add mustard seeds to it and allow it to splutter. 6. Add the rest sliced onions allow it to turn brown. 7. Add grinded coconut mixture ,broken pieces of soaked kumkum ,curry leaves and seasoning salt .Saute it for 2 mins. 8. Add the prawn to it. 9. Add water to three fourth level of prawn mixture. 11. Pour fresh coconut oil over. :- Serve the dish after garnishing with Curry Leaves. This dish will go fine with Rice,Chappathi.